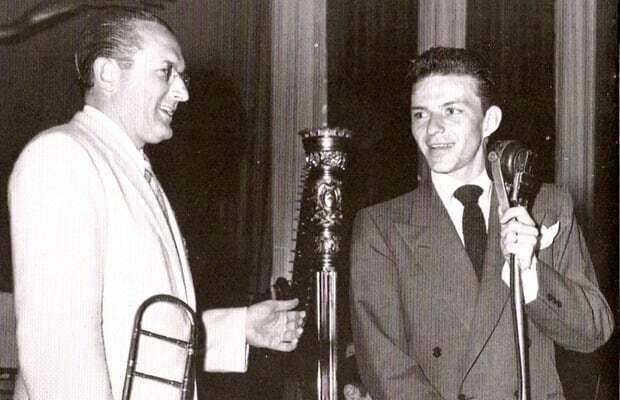 In the beginning of his career, when Sinatra was just a skinny kid crooner from New Jersey, he signed a crazy contract with bandleader Tommy Dorsey for the right to be in the famous trombonist's group. In his article “Frank Sinatra and the Mob,” Bruno writes, “In 1943, Sinatra's representatives tried to get him out of the contract, offering Dorsey $60,000 to rip it up. Dorsey, who had a reputation for being tough, refused." Bruno continued, writing, "By some accounts, hard negotiation eventually convinced the bandleader to take the offer, but other accounts say that Sinatra's godfather, Willie Moretti, convinced Dorsey to see the light…Moretti bragged in private that he and a few associates paid an unannounced visit to Dorsey in Los Angeles. Moretti allegedly jammed the barrel of a gun into the trombonist's mouth and got him to release Sinatra from his obligations in exchange for one dollar."